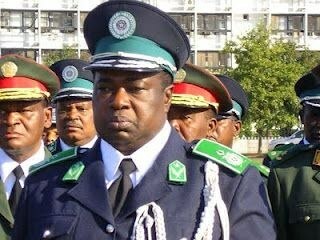 All Africa reports based on a report in independent daily O Pais, that Muianga and four subordinates were arrested at the end of March on charges relating to the storing at the Nacala Police Command of weapons (62 automatic weapons (such as AK-47, FN and G-3 rifles) and 8,465 bullets) owned by the owners of vessels moored in the port of Nacala for protection against attacks by Somali pirates in the Indian Ocean. National police spokesperson Pedro Cossa claimed on 3 April that the authorities knew nothing about the circulation in the country of guns and ammunition belonging to shipping operators, much less that police installations were being used to store such equipment. Muianga on the other hand claims that the operation was perfectly legal and well-known to the Nampula police command. One of the freight companies involved in the transport of the weapons, Mocargo, issued an indignant release denying that it had done anything illegal, and pointing out that freight agents always notified the port and police authorities about any movement of weapons. In Mozambique as in many other countries no-one may be detained for more than 48 hours without court authorisation. Muianga and his subordinates were taken before a magistrate who granted them provisional release, while the case was being investigated. Police immediately re-arrested the five, and took them to cells in Nampula city on the orders of the General Command. Police said they were detaining the men, not for criminal proceedings but for disciplinary action under the police internal regulations of 1987. Lawyers for the detained police officers submitted a writ of habeas corpus on behalf of Muianga and two of the other four. Once again they were called into court, and once again the courted grant the men provisional freedom. A bizarre stand-off then took place with the police command ordered their men to block the door to the courtroom, at to keep position inside the corridor and outside the building. The police demanded that Muianga and his colleagues be sent back to the provincial command. Fearing that they were about to be re-arrested for the second time, they took refuge in the office of the prosecutor. Hours of negotiations followed until 19.30 the provincial chief attorney received a phone call, passed the phone to one of the policemen on the door who then ordered the police unit to leave. Much of this drama was filmed by the independent television station STV. The attorney did not say who made the call, but it was presumably a senior figure in the police or Interior Ministry. But Khalau, speaking on Monday, insisted the police had been within their rights to hold the five men. O Pais quotes him as saying, "We know the laws. We don't obey any judge", he said, "We take our own internal measures. They say that our regulations are out of date. But what year does the Penal Code date from? 1886! Is it only the police regulations that are out of date? There was a violation of our internal norms." He insisted that the guns in the Nacala command were there illegally, and only senior government figures, such as the Ministers of the Interior, of Defence, of Finance or of Transport, could authorise the entry into or transit through the country of military equipment. "These weapons entered the country illegally, without obeying these norms and procedures", he said. Instead of alerting their superiors, Muianga and his colleagues had charged the shipowners and freight companies money for storing the weapons. "The Nacala commander accumulated a lot of money", said Khalau. Mocargo, however, flatly denied paying any individual police officer for these services. Cheques were made out to the police force, and "the issuing of cheques in favour of individuals is expressly prohibited". This, the company says, can be proved from the receipts issued by the police. Khalau said that the other police members (presumably the two who were not involved in the habeas corpus writ) have already been questioned under the disciplinary proceedings and released. Weapons storage was not just a freelance operation in Nacala. Khalau acknowledges the Department of Order in the Nampula Provincial Police Command not only knew about the weapons storage but had authorised it. But Khalau says the provincial body did not have the power to grant such an authorisation. "There were irregularities, and this is our disciplinary measure", he insisted. "If the police did not have an internal regulation to guide it, there would be abuses". Khalau's attitude is in contravention of the Mozombican Constitution, which provides in section 215 that court decisions are binding on all citizens "and prevail over those of other authorities".